Getting a good night’s rest can be hard when you’re sleeping on a bad pillow. You may have one that’s lumpy or too flat due to frequent washing. Whatever your situation is, a bad pillow can leave you with a sore neck or a throbbing headache. If you’re tired of waking up tired, it’s time to make a pillow change. Listed below are four pillows which have been found to increase comfort and renewal for your body. When you’ve had a bad day, these pillows will make you forget about your problems at least for seven to eight hours. The Coop Home Goods Adjustable Memory Foam Pillow is one of the best pillows. This eco-friendly pillow case is made from 60% polyester and 40% Bamboo. Provisions are made to allow you to adjust the comfort level of the pillow. You can do this by removing a portion of the shredded foam. Once this is done, you can enjoy a full night’s rest. This ergonomically designed pillow is made to cradle your head and neck in the correct position. So often standard pillows allow your head to lay lower than it’s supposed to. When this occurs, your equilibrium is thrown off and you will wake up dizzy. If you’re concerned about any possible chemicals this pillow may have, you can rest assured that this pillow does not pose any health risks. In fact, this pillow has CertiPUR-US Certified foam. This means that it’s free of hazardous chemicals such as ozone depleters, phthalates, formaldehyde, lead, mercury, flame retardants, PBDEs, TDCPP, TCEP, and heavy metals. Sometimes products are advertised to attract consumers to the cover of a product and will not reveal the contents. Coop Home Goods is transparent about its manufactured products and strives to support consumer health. The Bamboo cover and the shredded foam increases air circulation. This can reduce a lot of head sweating and pillow flipping. This memory foam pillow is also easy to maintain. Although this pillow is hypoallergenic and resist dust mites, you can machine wash it on a regular basis to get rid of excessive oil and dirt. This pillow’s five-year warranty is another guarantee that you will be able to enjoy this pillow for a long time. More than 8,000 customers purchased this pillow through Amazon. 76% of customers rated this pillow five stars. This is based on the adjustment allowance, comfort, and size. However, more than 1,000 customers could not find the comfort they were looking for in this pillow. One of the issues mentioned was related to the shredded foam and the odor which was perceived to be chemically based. If this customer was not familiar with shredded Visco Elastic Memory Foam, the odor would definitely be a surprise. One reviewer felt that this pillow was too soft and did not provide a significant amount of firm support. This is a critical concern especially for those who suffer from back and neck pain. Madison posted a review about this pillow. An explanation is given regarding … “The Importance of a Supportive Pillow for All Sleep Positions.” This section of the review can enlighten many readers about the reasons why they might wake up with aches. One primary reason is … “The space created between the mattress and your head caused by the gap between your shoulder and neck makes it hard to keep your spine aligned when laying on your side. No matter how you curl up, or twist and turn, that gap will always make it hard to keep your neck straight”. This explains why you might also feel tension in your lower extremities after you wake up. The pressure that your neck encounters during the night can easily trigger muscle spasms and tight joints. Coop Home Goods Adjustable Shredded Memory Foam pillow can help ease the pain. If you don’t have the best mattress and cannot afford to replace it right now, this pillow can help you until your budget allows you to replace your current mattress. One little change can make a world of difference. One thing to remember as mentioned on the Bpillow review site is that a memory pillow is flexible and conforms to your movements. So if you have a certain position that you must sleep in, this pillow will adjust to your needs. Madison also explained the importance of the CertiPur-US Certification regarding the manufacturing of a memory foam pillow. The benefits and disadvantages of owning this type of pillow are listed based on the reviewer’s perception. One area of concern as mentioned from one reviewer who purchased this pillow through Amazon was the odor. This issue was also addressed in the Bpillow review. According to Madison, … “All memory foam can build up an odor when packed for shipping. This may be alarming to new users when they first receive their package. It is easy to resolve this issue, and is necessary with any foam on the market. Just let it air out a few hours to allow the odor to dissipate naturally”. A short video review is also posted on The Sheep Sherpa’s YouTube Channel. The reviewer unwrapped the pillow and recommended placing it in a dryer for it to expand. However, the king size pillow he unwrapped looked very nice and began to expand on its own. If you’re looking for a memory foam pillow that offers therapeutic benefits, Sleep Innovations Cool Contour Memory Foam Pillow is a good option. This pillow takes care of your head and neck as if it were a treasure. If you’re a back or side sleeper, this pillow will provide the firm support you need for a good night’s rest. This memory foam pillow is relatively light and provides a significant amount of resting space. Sleep innovations does not mass produce pillows without knowing what people need to sleep comfortably. This company has tested and created a memory foam pillow that will accommodate a variety of sleepers. The cooling comfort that this pillow generates is one of the main reasons why numerous customers have given this pillow a high rating. When comparing this pillow to some of the higher brand pillows, one customer claimed that it’s equal in value. This suggests how well constructed this pillow is. The firmness does take some time to get used after laying your head on it, but the foam eventually contours to the shape of your head. Despite raving reviews, some customers have noted an unpleasant smell, contour differences, and quality control issues. These challenges are ones that can definitely prevent you from getting the sleep you desire. A video review about this pillow was posted on YouTube by Nokiboshsri. The reviewer’s “Cool Home Gadgets Review” was very informative. Nokiboshsri also had a brief unpleasant experience with the pillow’s odor, but it was not a long term issue for him. He took the manufacturer’s advice and allowed the pillow to air out. He purchased the pillow because he was suffering from neck pain. He gave the pillow a 3.5 star rating and recommended it as a good purchase. On Thoroughlyreviewed.com, the Sleep Innovations Cool Contour Memory Foam Pillow was voted as the “Top Pick.” A very detailed description is provided regarding the benefits, the materials, and the dimensions. After reading this review, you will have a better understanding of what your options are and why this pillow is a good product. A product comparison is also listed to give you an overview of the number of benefits that are available from this pillow and other well-known brands. The list of comparative functionalities were pressure relief points, improved air circulation, head temperature control, comfortable, head alignment, no tossing, motion transfer elimination, spot clean cover, lucid gel formula, and silver infused cover. These features are certainly worth evaluating before making a higher brand investment. This pillow was also reviewed by Lowell on the Top Pillow review site. The pros and cons reflected those of reviewers on Amazon and other sites. Lowell highlights the benefits you can receive specifically because … “The original design is intended to provide an orthopedic impression that promotes correct spinal alignment throughout every night, which has been known to elevate snoring, insomnia as well as providing relief for stress”. This pillow also made it to Sleep Comfortably’s “The Best Memory Foam Pillows Reviews Guide for 2015” (www.sleepcomfortably.org/memory-foam-pillows-sleep-soundly-comfortably/). Although this review does not go into extensive detail about its specific offering. A generalized review about memory foam pillows is given so that readers will understand the effects of improper head and neck alignment. Other factors are also highlighted so that prospective customers will know what to expect after purchasing a memory foam pillow. The Sleep Innovations Cool Contour Memory Foam Pillow is also backed by a support team. If you run into any issues, you can contact Sleep Innovations by email or telephone. This pillow is reflective of its name. If you want to enjoy comfort without working extra hard to create it, this pillow could be the ideal choice. 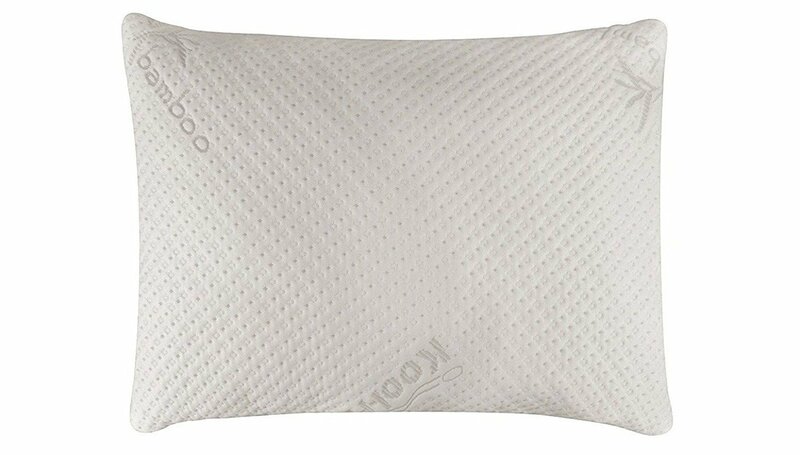 The Snuggle-Pedic Kool-Flow Bamboo Shredded Memory Foam Pillow is made from 43% Viscose of Bamboo, 56% Polyester, and 6% Lycra. This pillow is also Certipur-US Certified. This means that you don’t have to worry about being exposed to hazardous chemicals. The fiber combinations work together to reduce night sweats. The Snuggle-Pedic Bamboo Memory Foam pillow is made of quality material that won’t shrink. You can machine wash the pillow and continue to enjoy its original shape thereafter. The material that provides the support you need to reduce pain in your neck, side, and back is the Biogreen® and Certipur-US Memory foam. The Kool-Flow Bamboo cover also promotes air circulation so you can rest easy. Reviews from 2,093 customers were posted on Amazon about this pillow. 74% of reviewers rated this pillow five stars while the remaining 26% found some issues that were not worth giving this pillow the full rating. One of the five-star reviewers discussed her history of back and neck surgeries as well the benefits she gained as a result of sleeping on the Snuggle-Pedic Bamboo Shredded Memory Foam Pillow. She commented on her tedious 25-year search for the right pillow. Her search came to a happy end when she purchased this pillow. She also highly recommended this pillow and thinks that it is a valuable investment. Other customers also agreed with this reviewer’s conclusions about the pillow. The negative reviews were based on dissatisfaction with the lack of firmness. Some commented about how the pillow flattens or becomes lumpy after a while. This made it hard for them to sleep especially when some of the reviewers were looking for neck pain relief. These challenges may be due to the shredded contents of the pillow. A review of this pillow is posted on Consumersearch.com. 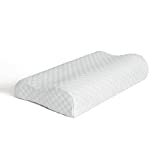 The Snuggle-Pedic Bamboo Combination Memory Foam Pillow Review begins with a list of pros which include … “comfortable, supportive, maintains shape through night, relieves neck, shoulder, and back pain, 90-day refund; 20-year warranty”. The cons list reflect previous complaints about the pillow’s odor. Overall, the review on Consumer Search provides a summary of the praises and complaints that customers gave regarding the quality of this pillow. A video review can be found on Rev 2.0’s YouTube channel. The unveiling of this pillow was done to show what steps you have to take to get to the pillow. The pillow’s natural inflation process revealed that you don’t have to fluff up the pillow to start enjoying it. Brittany Barber (2015) wrote an insightful review about the “Snuggle-Pedic Bamboo Shredded Memory Foam Pillow.” The benefits are emphasized particularly to encourage those who suffer from allergies to consider a memory foam pillow that is hypoallergenic. Although advertised to have microventilation, one of the cons that Barber (2015) listed was that … “There were sweating issues with the pillow as the ventilation mechanism is found not to be too effective”. This factor along with the pillow’s tendency to flatten and the high price appear to be the only negative aspects that contributed to several customer’s dissatisfaction. However, the therapeutic benefits and firm support were areas that most customers were able to obtain. Overall, the perception of Snuggle-Pedic Bamboo Memory Foam Pillow indicates how needs vary from one sleeper to another despite raving reviews. Whatever your needs are, the Snuggle-Pedic Bamboo can provide a significant amount of support. It may just take a while to get used to this type of pillow. If you suffer from cervical pain, the Bedsure Memory Foam Contour Cervical Pillow may be able to comfort you. Bedsure has crafted this memory foam pillow to help align your head, neck, and shoulders in the right position. While you’re sleeping on this pillow, you’ll notice how relaxed you will become after laying your head down. Your body will then respond to the comforting memory foam. If you prefer to sleep on your side, you won’t have to worry about feeling excessive pressure from your shoulders. This pillow will adjust to whatever position you choose. The memory foam is made from 100% polyurethane and the cover is 100% polyester. 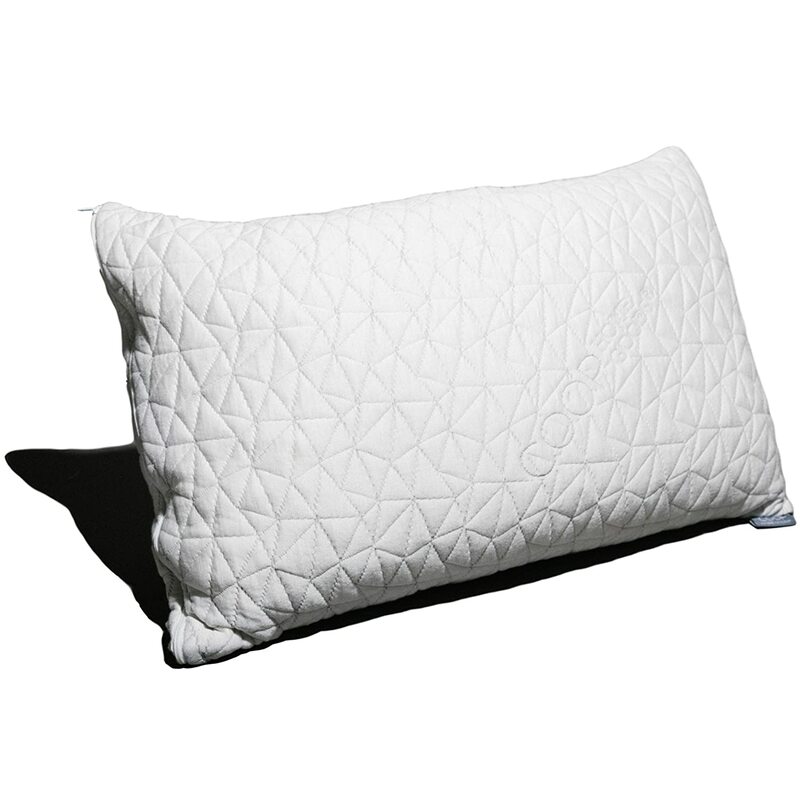 The antibacterial and bug-resistant features make this memory foam pillow can good product. Although this pillow also reveals an unpleasant odor after unwrapping it, the odor should disappear within 72 hours and should not exceed two weeks. Precautions are given regarding the maintenance of this pillow. You must be careful not to wash the foam. The cover is the only part that should be machine washed in cold water and air dried. Hand washing is also recommended to extend the life of the cover. This pillow comes with a 30-day return and replacement along with a five-year warranty. Customer service is available by email if you have any concerns. 84 customers who purchased this pillow through Amazon decided to share their thoughts about its performance. 58% rated this pillow five stars while the remaining 42% had varying opinions. One of the main benefits most customers were able to enjoy was the ability to get a full night’s rest. Some reviewers thought the memory foam was too firm or too small. These issues are important things to consider. So make sure you don’t select a standard size pillow if you are used sleeping on a large size one. This pillow also made it to the “Best Cervical Pillows” list. The Bedsure Memory Foam ranked number four on this list for its benefits to side sleepers, hypoallergenic material, and dust mite resistant feature. These benefits are reasons why this pillow could become one of the favorite things you resort to after working all day. The contour shape reduces the need to fold your pillow when you’re trying to find that perfect position. If this is your first time purchasing a memory foam pillow, this pillow may be able to take away the fear of not being able to find comfort in any pillow. The low price can also be another reason to try this pillow. The high quality memory foam and comfort can definitely help you rest better. 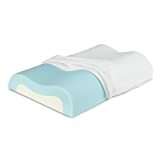 A Bedsure Memory Foam Pillow can reduce pain and help you get the type of rest that other customers received who gave this pillow a high rating. Material is one of the main benefits you should consider prior to purchasing a pillow. If you’re allergic to dust mites or other allergens, purchasing a regular memory foam pillow may not work for you. Upon selecting a pillow, you should make sure that you read the material details to see if the pillow is hypoallergenic. This can save you trips to the doctor when you’re suffering from allergy-related symptoms. Weight makes a difference in being able to find your favorite comfort spot. Some pillows that are light end up becoming flat very quickly. However, some memory foam pillows are able to hold the weight of your head and assume its original position after you’ve laid on it for hours. Although relatively light, some memory foam pillows hold a significant amount of weight to provide the comfort you need to keep your head and neck properly aligned. When shopping for that perfect memory foam pillow, check to see if the weight is too light to reduce discomfort. A pillow that’s too firm can also be a nightmare and may take a while to break in. A pillow’s size can make a big difference especially if your head, neck, and shoulders don’t fit the pillow’s diameter. Stacking pillows can also be a problem. When you stack too many, your head will be tilted too high. On the other hand, if you don’t stack enough, you run the risk of laying down too flat. This can lead to discomfort. If you have a tendency to sleep on your side or back, you should make sure that your pillow is able to accommodate your turns. Otherwise you will have to readjust your pillow position several times, your sleep will be interrupted, and you will wake up feeling more tired than you were prior to going to bed. Shopping for new pillows can be kind of tricky. If you need a few, you might be tempted to select pillows that are discounted. However, you should evaluate the quality. If you purchase pillows that appear to be good just because they’re fluffy, you might end up with flat ones in a week. Always read the labels and read reviews to see what challenges may be long term problems. Check to see how certain pillows fair after they are washed. If a quality brand is not on sale, wait a few days until the price range you can afford is available. This can help you avoid the likelihood of having to replace pillows frequently. Memory foam pillows have become a welcome friend to many customers’ bedrooms. The comfort that this type of pillow provides is superior to standard pillows. When you purchase a memory foam pillow, you’ll improve your sleep patterns and your health. When you’re able to get a good night’s rest, you’ll wake up refreshed and ready to enjoy your day. Memory foam pillows reduce headaches, back pain, and other problems related to the head-spine areas. The cost effective factor can also reduce medical expenses related to allergies and chronic pain. The more information you review about memory foam pillows and the benefits, the more likely you’ll want to place an order for one quickly. They can aid in your overall health by helping your muscles and joints relax. Although many customers express discontent with some options, there may be other underlying factors that may be contributing to their discomfort. You should evaluate your needs and base your decision on a pillow’s outstanding features.